The art of concert dance documentation, like all arts, requires dedication to technical training. Effective documentation requires proficiency with features of the video camera, as well as mastery of camera movement involving sensitivity, coordination, and control. Below is a list of technical issues, followed by techniques/recommendations for improving performance behind the camera. Clarity of image is essential in producing high quality documentation products. Accomplishing this requires clearly focused recordings that simulate the experience of live performance viewed with the details of 20/20 vision. 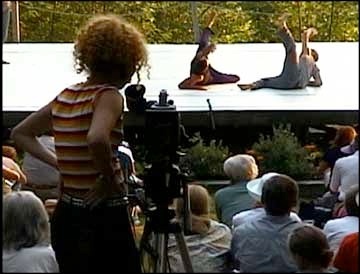 One issue, quite unique to dance performance, is that the subject area for documentation is typically a large-scale surface containing movement simultaneously in the foreground and background. 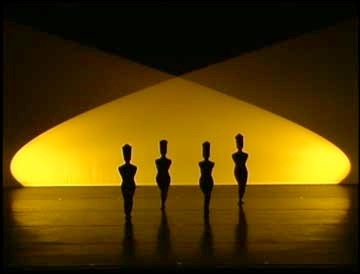 Keeping the entire depth of the stage in focus throughout a dance, or evening of dances, is no easy task. This can be especially problematic for follow shots that encounter a constantly changing distance between lens and subject. Maintaining sharp focus involves familiarity with a number of camera features, as well as an understanding of depth of field (DOF). We’ve probably all witnessed poorly documented dance that included blurring, breathing focus each time a dancer passed in the foreground of the shot. Because of the ever-changing spatial arrangements in dance it is recommended that manual focus be used for documentation purposes. This involves locking in the most ideal focus and preventing the camera from thinking for itself. When defining a focus it is important to understand that there will be only one distance from the lens that is in perfect focus, and all other points are gradually less focused the further they are form this point. The range of distances from the camera at which acceptably sharp focus can be obtained is known as depth of field (DOF). Areas outside this range are often referred to as being in Soft Focus. DOF will tend to extend 1/3 in front of the focus point, and 2/3 behind it. This fact determines the placement of a focus card as 1/3 of the distance into the dancing area of the stage. A focus card placed at this location should include a high contrast, hard-edged image that the camera can easily use for focusing. This card may also include a large white area for use in white balance. See White Balance below. DOF is basically determined by the iris setting: the smaller the iris aperture, the greater the depth of field. This means that the more light you have on stage, the easier it is to focus. Unfortunately, abundant light is rarely the case in concert dance performances. In very low-light situations where the iris is open wide, depth of field is significantly reduced and focus becomes quite a challenge. - Move the camera closer to the stage, therefore closer to the lighting source. - Add some digital gain, although this compromises picture quality. - Reduce shutter speed, although not recommended for fast moving images, like dance. This excerpt from Salon by Nancy Smith Fichter poses the challenge of documenting a duet which includes a variety of depths. Based on the idea that sharp focus is determined by defining a focal point at a specified distance from the lens, it must be true that any point along an arc at that distance will also be in focus. One technique I have used for resetting a focus during a pause in performance involves the use of a predetermined point in the theater, equal in distance from the camera as the ideal focal point located 1/3 of the distance into the stage. As the house lights briefly illuminate the theater for the audience to see their programs one can zoom in on this predetermined spot, reset a focus, zoom out, and pan back to the stage with a newly confirmed focal distance. This is especially useful if the focus ring is accidentally bumped during performance. Some cameras have focus limitations related to color of light. 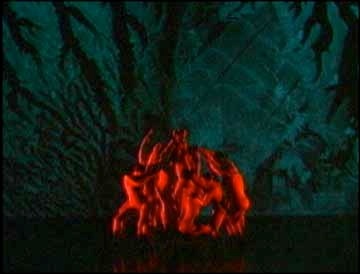 Lighting designs containing a large degree of red may result in a “bleeding” image that appears out of focus. Also, the use of haze and smoke on the stage can present challenges for sharp focus. One may want to discuss these issues when designing lights to determine if priority should be given to lighting that videotape well. - Determine placement of tripod and camera. This establishes one of the coordinates used to determine distance between camera and focal point. - Set camera in Manual Focus Mode. - Place a focus card at a depth 1/3 of the distance into the performance space. - Zoom in as tightly as possible to the focal point. - Press and hold the Auto Focus button, or temporarily place camera in Auto Focus Mode until image comes into focus. This defines the second coordinate used to determine focal distance. Return camera to Manual Mode to lock in focus. - Repeat this sequence if camera placement is modified. Moving the camera alters distance between lens and focal point and can change DOF. 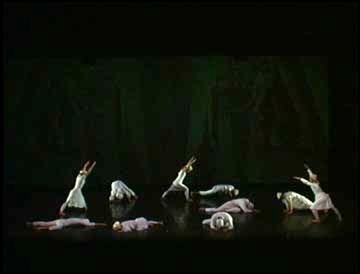 White blobs of washed out dancers with no apparent detail, sound familiar? What about faintly lit silhouettes and shadows hardly distinguishable as moving bodies? Whether overexposed or underexposed, documentation footage may be improved by controlling the amount of light entering the camera. Footage shot of a brightly lit stage recorded without monitoring the excess light allowed into the camera is an irreversible tragedy. Even the best editors in the world cannot magically bring back the lost detail of costumes, faces, and subtle gestures. Add this problem to the frequent lighting changes within a dance and one is faced with many challenges when videotaping concert dance. The human eye has a much greater value range than the camera and therefore requires constant attention to exposure. See Lighting in the Aesthetic Issues section for more details. White costumes and projections, two very challenging elements, are combined here in Blank on Blank by Alwin Nikolais. Whether shooting in live performance or during a session specifically for documentation, a number of related techniques may be applied to improve video quality. In both situations, it is important to develop a partnership with the lighting designer. Manual exposure is always recommended. 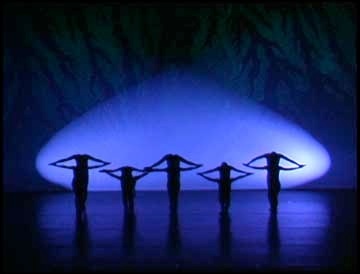 When shooting during live performance it is recommended that the initial cue for a dance be predetermined, so the videographer is able to anticipate the first look on the stage. From here the task of compensating for light changes on the stage is up to the videographer standing by with their thumb on the iris wheel. In an ideal situation, all videographers would be on headsets and would be given warnings prior to lighting changes. If time permitted, a cue list including iris settings could be created for each lighting change. In the situation of a video shoot for documentation a brighter lighting cue is recommended, which will allow for a higher shutter speed, more closed iris, and no gain. The combination of these will allow for control of exposure, while increasing the DOF. Some cameras have a Zebra Stripe function that provides visual evidence of overexposed areas within the viewfinder. This function may be set to depict different percentages of washout. This can be very useful when manually monitoring iris settings during a shoot. Unfortunately, it is not always possible to have this feature appear on an external monitor. Resident Videographer Peter Richards conducts a white balance with his video intern at Bates Dance Festival. Accuracy of color on video is an issue worthy of attention. We’ve probably all wondered why costume colors or skin tones seem to have been mysteriously modified by some form of hue adjustment. This problem is similar to that of adjusting the tint on your television monitor. This issue becomes even more problematic in stage performances due to the use of colored gels on the lighting instruments. White Balance, joins Focus and Exposure to become “The Big Three” technical issues that can most drastically improve or destroy video footage for dance documentation. Overcoming the problem of inaccurate color representation involves conducting a white balance prior to each video session. The purpose of a white balance is simply to define true white for the camera. Once this is accomplished, the camera will see all colors in relation to the defined white. 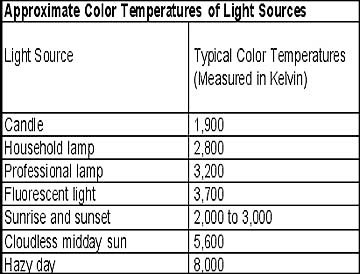 Without getting into great detail, cameras see colors differently depending on the temperature of the lighting source. Since different types of lights have different temperatures (incandescent, halogen, fluorescent, sunlight), it is necessary to set the white balance whenever there is a change in lighting source. Conducting a white balance involves the use of a white balance card, basically any truly white surface that the camera can use as a representation of white. A medium intensity lighting cue containing no colored gels should be used to create a neutral light situation. Gain should be eliminated. Set the camera’s white balance feature in Manual Mode. Zoom in to fill as much of the frame as possible with white and adjust the iris to prevent overexposure. Press and hold the white balance button until camera adjusts to display white as white. Lock in this setting for the duration of the shoot. As gels are added to the lights, colors should appropriately be represented on video. Most cameras retain their last white balance setting as long as they are not unplugged from the power source, or have a charged battery. White balance determines the accuracy of colors on stage in works such as these by Alwin Nikolais. Virtuosic performance behind the camera involves both the development of kinetic awareness and complete understanding of the nuts and bolts of movement potential within the camera itself and through the extended movement capabilities made available through the use of a tripod. Camera movement along the X, Y, and Z axis allows for an infinite number of choreographed combinations. An expertly trained dance videographer appreciates the ways in which motion on various planes may add meaning or impact to subjects in the eye of the camera. Such partnering with the camera requires manual zooming skills and a developed sense of pressure and resistance with the camera. In general, camera movement for documentation should never draw attention to itself, but should flow in accord with choreographic intent. Prior to beginning a documentation session videographers must finely tune their tripods, including setting the sensitivity, or resistance, for panning and tilting. Tensions should be determined as to allow for smooth initiations and controlled movements in all directions. One must become comfortable with a grip on the camera that allows for delicately pressing the camera into motion, coordinated with the body’s shifts of weight. One hand may be primarily assigned to the zoom ring for adjusting depth on the Z axis, while the other hand counterbalances the camera from the other side. Care should be taken when gripping and releasing the camera, as the smallest bump of the camera can be detected on video. Similar techniques and sensitivity to motion apply when utilizing a handheld technique without a tripod. More information related to camera movement may be found in the Spatial Intent in the Aesthetic Issues section. To contribute to this list of issues and techniques/recommendations, contact DanceDocumentation.com.